Nothing excites me more than having an excuse to constantly experiment and push the boundaries with my food. The idea of catering has always appealed to me and having had the opportunity to showcase my style of food to millions on MasterChef; now feels like the right time to launch my new venture. My Private Dining service will take out the stress of hosting a dinner party. I can take care of the menu, the cooking and the clearing up leaving you to spend time entertaining your guests. 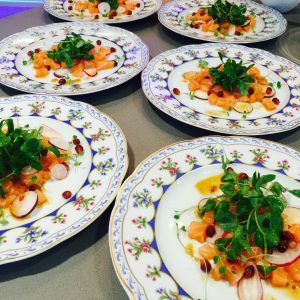 Whether its cooking for a small intimate dining event, or catering a bigger affair, I can offer a seasonal menu to suit the occasion. Please contact me with your request and I will get back to you as soon as possible. I offer a buffet style option where I can either drop all the food ready to serve in lovely dishes, or stay onsite to help serve. Menu’s can be tailored to suit. 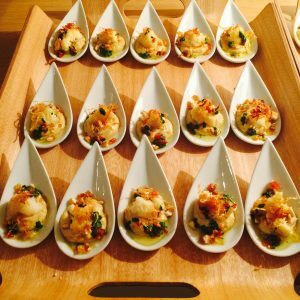 Whether its a formal occasion or a casual affair I can offer a selection of room-temperature style dishes to include vegetarian, kosher, halal and gluten free options.